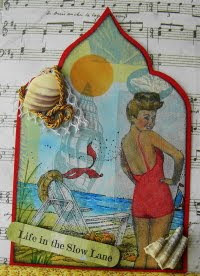 Vada's Blog Stamp Inks and Paper : Gothic Arches Challenge “Beach Bathing Beauties”. 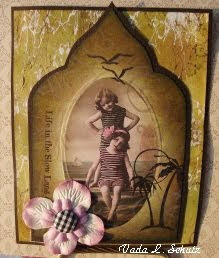 Gothic Arches Challenge “Beach Bathing Beauties”. I hope “Age” isn’t a factor on these Bathing Beauties? I found these little “Want To Bees” in my stash and couldn’t resist them. Stamps are from Rubber Cottage, Inkadinkado and Stampin’ Up. For the second Gothic Arch this was all stamped on printed papers. The rest are from Rubber Cottage. Again Thanks for stopping in. Labels: Gothic Arches, Inkadinkado, Technique Junkie Newsletter, The Stampsmith. What gorgeous art work ! They are both terrific! Cheers! Lovely arches... I esp. like the girls. 2 arches - so different and both so beautiful! Lovely! I like both of these, but especially the second one! I love them both but Betty is just "da bomb"! Fantastic work!